The older of our two daughters, Lindsey, lived in Pittsburgh for six years – four while attending college and two after graduating. Despite our many visits during this period, we never had the opportunity to explore Pittsburgh properly because our visits were either planned around helping her move or coordinated with also visiting family in Washington D.C., and our younger daughter who attended college in New Jersey. 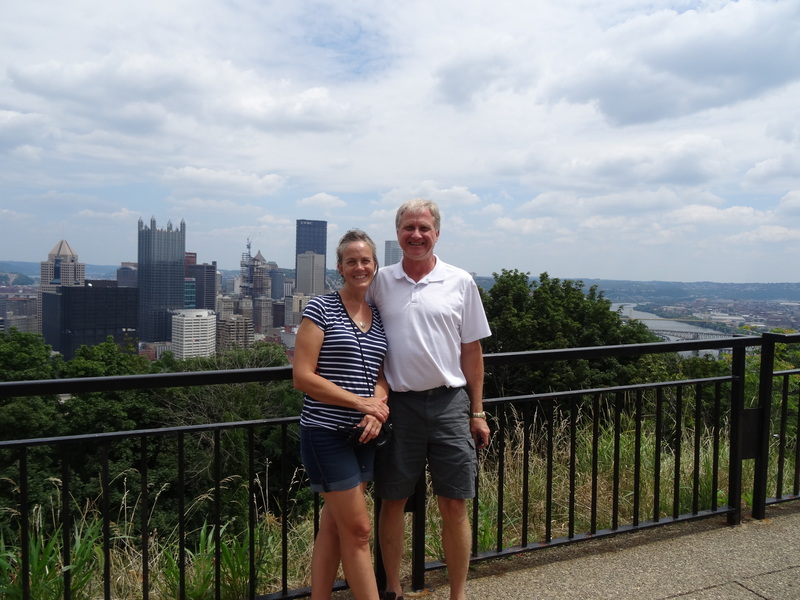 We were looking forward to finally spending proper time in Pittsburgh, a city we quickly realized was not the old steel town we had imagined when our daughter expressed interest in attending college there. No, it is a beautiful, vibrant, culturally rich city with a unique personality of its own thanks to the people that call it home. Their love of their city is evident. 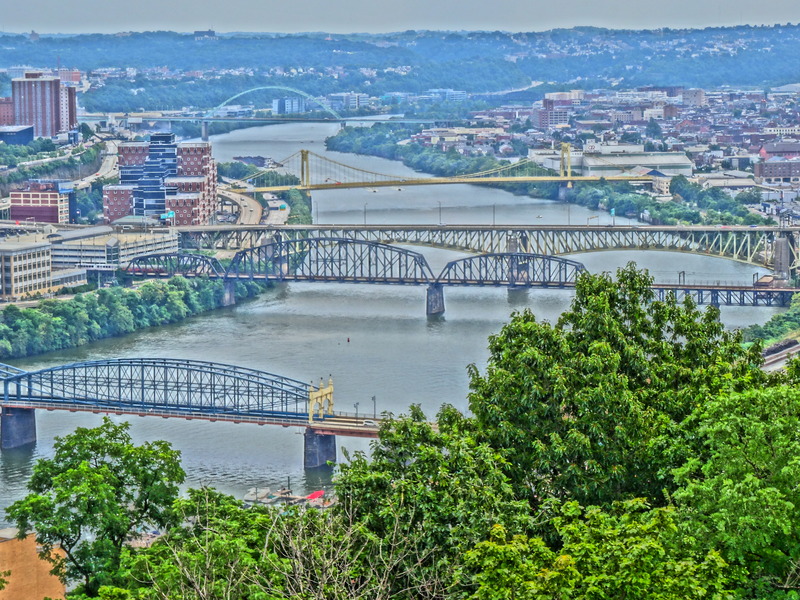 One of the best vantage points to appreciate the city’s beauty can be experienced when traveling into Pittsburgh from the west on Interstate 376 which is the route from the Pittsburgh airport. The Interstate goes through Mount Washington via the Fort Pitt Tunnel, and the city suddenly appears laid out below when emerging from the tunnel’s other side. We were fortunate to be required to take this route into the city from Niagara Falls, New York. We settled into an Airbnb cottage near Highland Park around 5:30 p.m., then rested before heading out by foot to explore the neighborhood. A friendly youth baseball game was taking place at a nearby playground and we stopped and watched as the sun was setting. 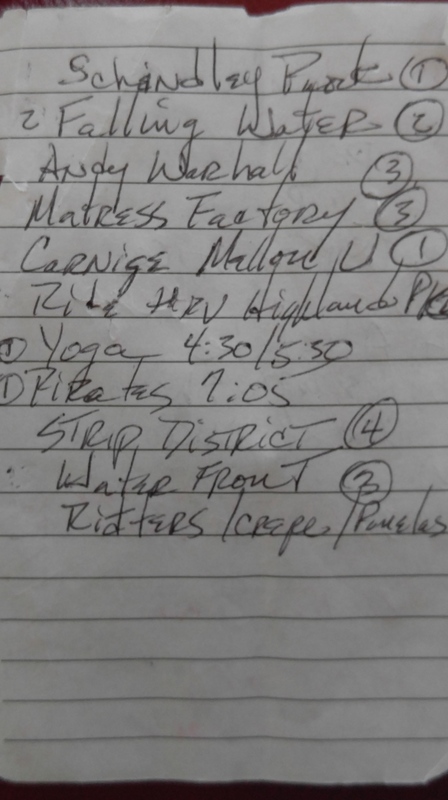 Trey pulled his pocket notepad out and we planned how best to spend the next three days. Our first day touring Pittsburgh was done by bicycle and our first stop was a nostalgic one – Ritters is a breakfast joint near the UPMC complex and in the Bloomfield neighborhood where we feasted on buckwheat pancakes and breakfast potatoes as we had done many times in the past with Lindsey. After the hearty breakfast (which we needed in order to tackle Pittsburgh’s hills on bicycle) we headed out to visit her other old haunts, perhaps in attempt to recapture the excitement and recognize the challenges of a time in our past. 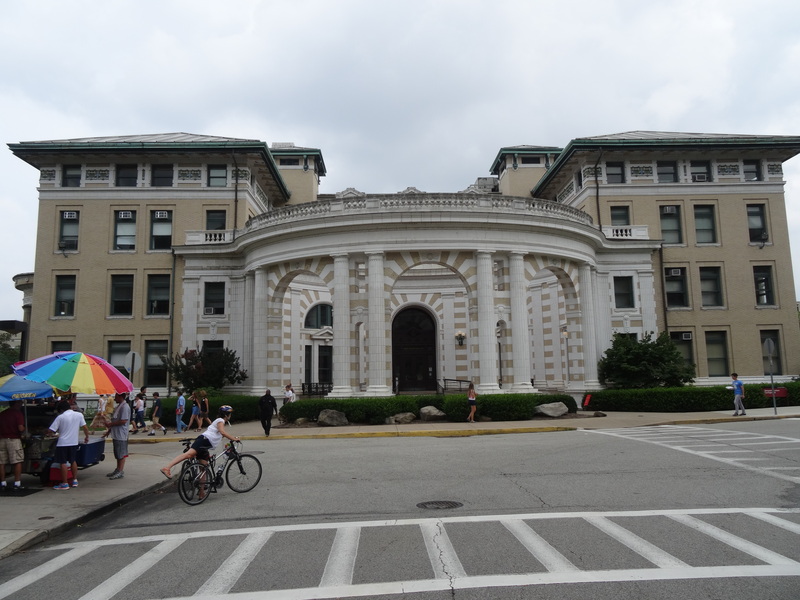 Being the middle of summer, the Carnegie Mellon University campus was quiet and provided clear pathways to bicycle through the small campus and into and out of the adjacent Schenley Park. PNC Park sits on the Allegheny River across from downtown and near the point where the Allegheny, Ohio and Monongahela rivers converge. There were plenty of public garages downtown to choose from for parking and you can get a real sense of the spirit of the city and its sports fans on the walk across the Roberto Clemente Bridge. This bridge serves as the gateway to the stadium – its grand entrance supported by the excitement and the energy of pirates’ fans anticipation of a big win – I think “Yinzers” always expect to win. With great fifth row seats looking over right field, PNC stadium provided the most intimate experience of all the ball parks we visited. 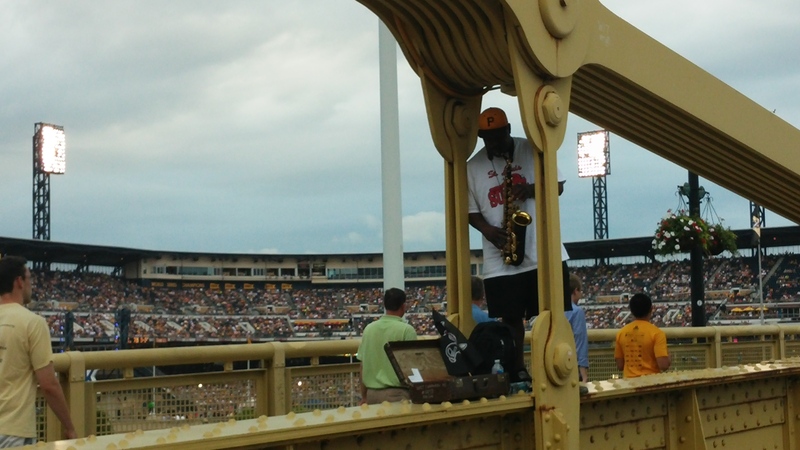 We were looking directly down on Gregory Polanco, and he and the other outfielders regularly engaged with fans. 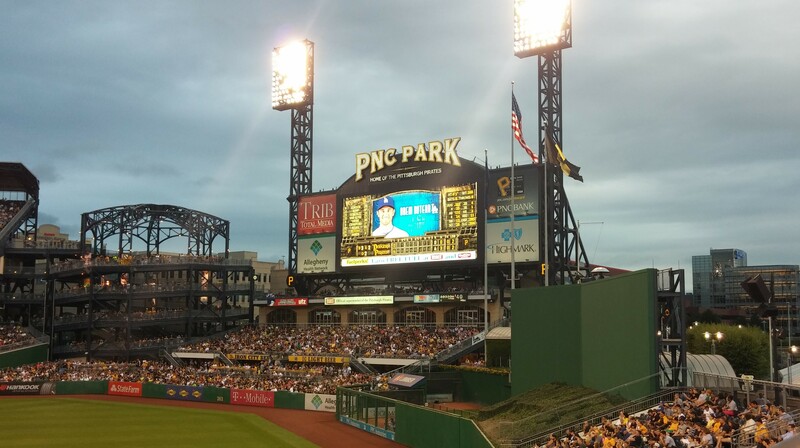 The Pirate fans around us set the tone of positive excitement and rallied on their heroes throughout the entire game – it was great fun, largely, I suspect because the Pirates led the entire game and beat the Dodgers 6-1. Day two started with another nostalgic breakfast. This time at Pamela’s in Shadyside for more Pittsburgh-style fried potatoes. 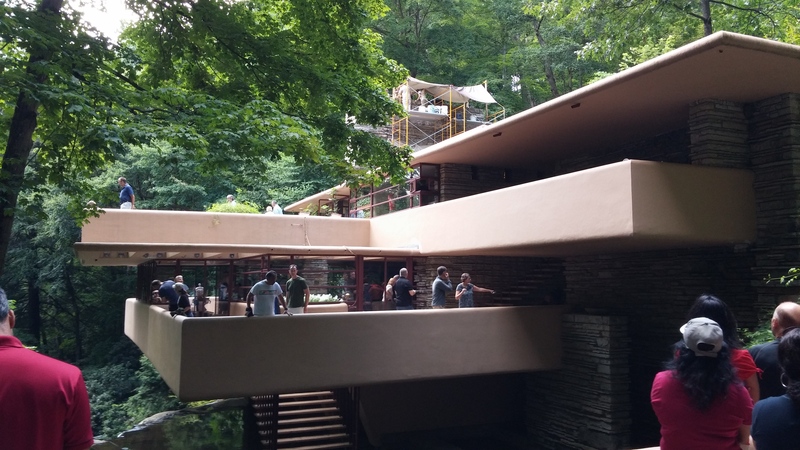 We then drove the Escape Mobile to Frank Lloyd Wright’s secluded architectural wonder located about 80 miles southeast of Pittsburgh – a bit of a trek, but well worth the roundtrip drive. Wright masterfully melded the structure, a family home, with its environment – a rocky creek gradually descending through a wooded sanctuary of oak and maple trees. The main structure of the house sits above the creek and each level opens onto an outdoor space that overhangs the creek providing the sense of being in a tree house from every room. The guest house sits above the main house and I was glad that it was open to the tour as it was not open during my trip to Falling Water in the fall of 2002. At that time, cable supports for the main house were being installed to keep it secured on and above the creek bed, instead of in it. Restoration work was underway on the main house’s chimney and roof of the guest house. 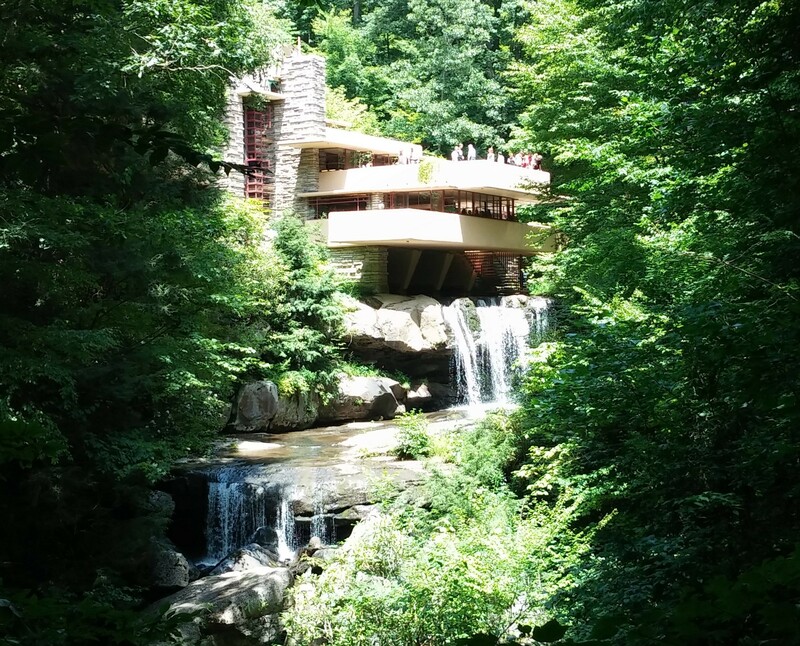 It was very evident that this national landmark is well cared for and its overseers, The Western Pennsylvania Conservancy, take their mission to preserve Falling Water for future generations very seriously. We stopped in Pittsburgh’s Strip District to eat on the trip back from Falling Water. The Strip District sits along the Alleghany’s eastern shore which was once a thriving industrial area. During that time, small retailers set up various shops and were supported by the workers. The industries are gone, but some of the Strip District shops remain and provide a glimpse of how shopping was done before large all-in-one grocery stores took over. For instance, there’s a cheese shop that sells only cheese and a meat market shop that sells only meat. Many of the old shops and warehouses have been taken over by restaurants, art galleries and touristy type shops making it popular area to visit and shop by both locals and visitors. However, being a Thursday evening, we found the choices of restaurants to be limited so settled on Café Reyna for decent Mexican food. Came across this sign on the MF’s Annex building. Very fitting and so true! Friday was museum day. The Mattress Factory is an installation art museum. It provides housing for visiting artists while they work on their pieces. 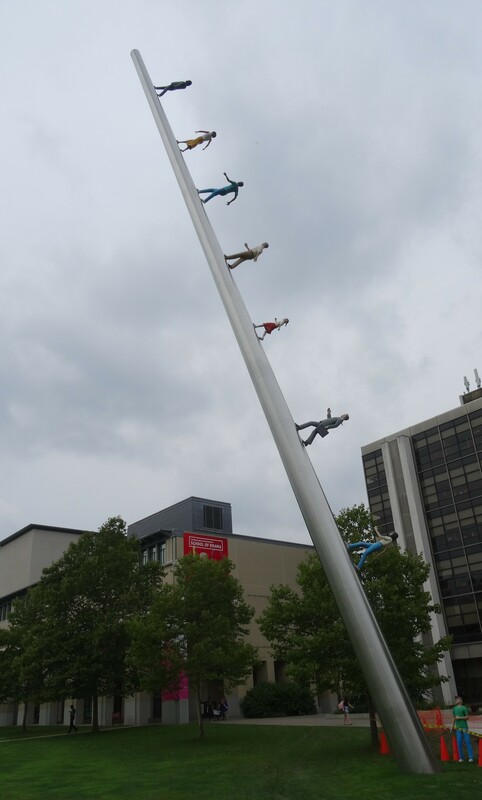 Lindsey had the privilege of working with several artists on installations during her time working at the Mattress Factory. Our timing had us visiting between installations so only the permanent installations were available in the main building – lots of fun showing Trey around and experiencing them again. We found out that there was a new exhibit in the Mattress Factory Annex building around the corner. Trace of Memory by Chiharu Shiota encompassed the entire three story row house and was quite an experience. 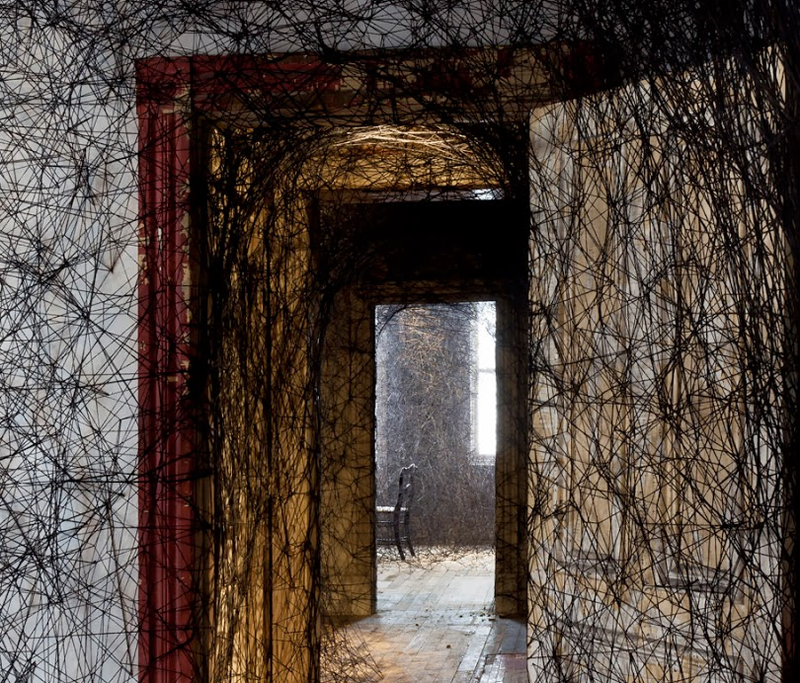 Shiota had woven black yarn throughout like thick spiderwebs, obscuring a seemingly typical household and successfully creating the eerie perception of walking through someone’s dream or distant memory. We happen to visit the Warhol Museum during their regular Friday evening event in which they offer ½ priced admissions, light snacks and a cash bar – so wonderful and appropriate to experience Warhol with a cocktail in hand! Unlike my visit in 2002, photographs were not allowed inside. Rightly so, because any photo that I post here could not possibly do justice to an original Warhol. The colors would lack the vibrancy and verve, and the thumbnails would remove any ability to conceive the scale and energy of the original pieces. 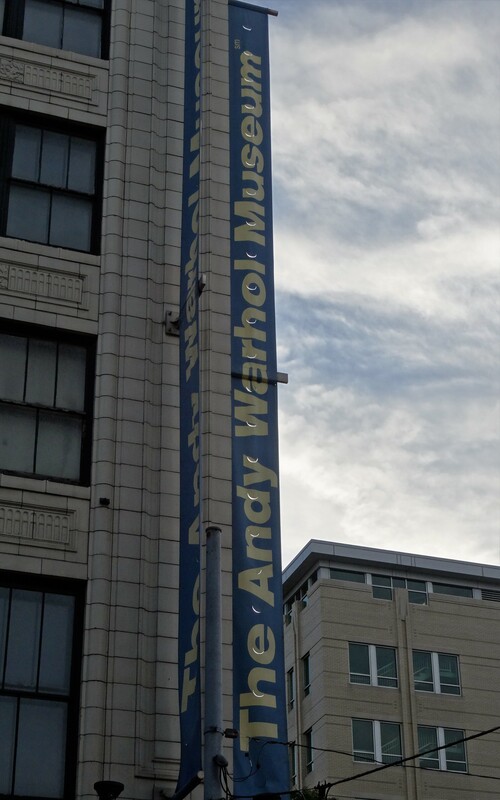 These can only be experienced in person; so, like Falling Water, the Andy Warhol Museum is a must visit when in Pittsburgh. I had packed my yoga mat in the back of the Escape Mobile but had not yet put it to use. I was glad to be in a city such as Pittsburgh where studios were abundant. I arose early on Saturday, our last day in Pittsburgh, and took a very much needed and revitalizing drop-in class at Yoga on Centre. This was my first yoga experience outside of Austin and I realized that I, and my body, had been missing yoga, so decided that I would make effort to look for classes from that point. Our Airbnb host was a bit upset that we had yet to try any of his restaurant recommendations. Highland Park is apparently full of great restaurants and hot spots and somehow we got to Saturday without having ventured to a single one. As we packed the Escape Mobile we promised him that we would catch brunch up the street at Park Bruges. 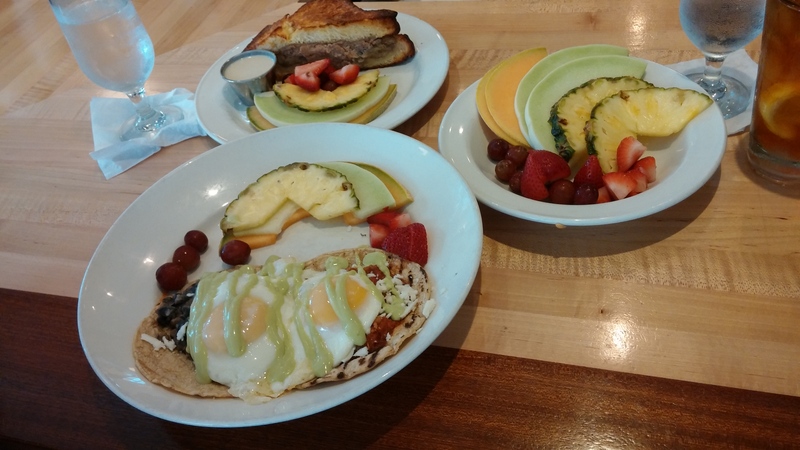 So glad we did – Park Bruges was by the far our best food experience in Pittsburgh. 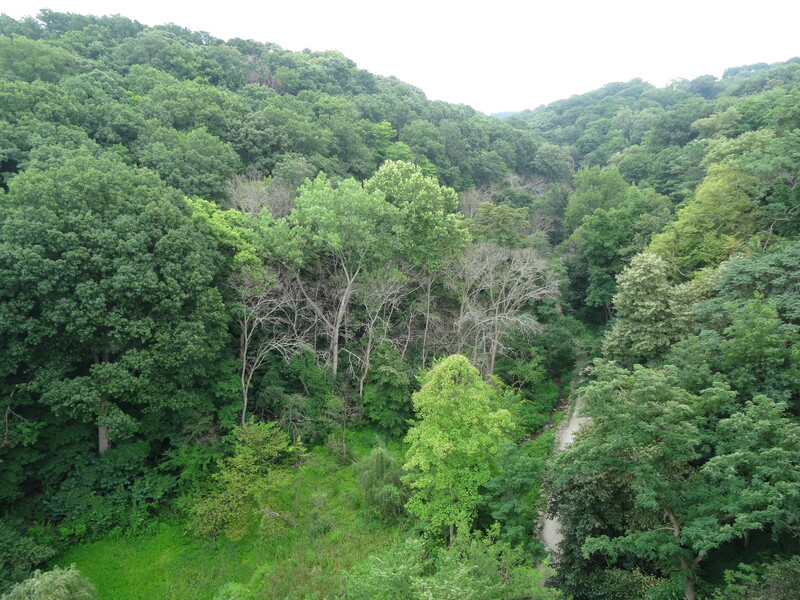 We also had yet to make the drive up Mount Washington to enjoy the scenic views of Pittsburgh and its rivers. This is the same view we experienced when we emerged through the Fort Pitt Tunnel upon arriving in Pittsburgh, only weren’t traveling 60 miles per hour. Goodbye Pittsburgh…Hope to visit again!